Sometimes dogs can get an upset stomach, eat the wrong thing, come down with something, or for some other reason end up vomiting. This can be a scary experience for a dog owner because it’s usually not clear what exactly is causing your dog to vomit. If your dog cannot even keep water down, don’t wait longer than 24 hours to take your dog to the vet. It could be an indication of a more serious condition such as a blockage or obstruction. Don’t give your dog any food for 12 hours. Often, it is just a matter of letting the inflammation of the lining of the stomach settle down to cure your dog’s vomiting. However, if after 12 hours your dog is still vomiting, give it another 12 hours (if he’s a full-grown dog and not a puppy). 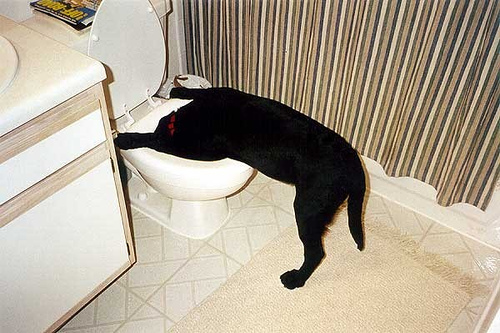 If your dog is still vomiting after 24 hours, then you should take him to the vet to determine if it is a more serious condition causing the vomiting. Repeatedly offer ice chips to prevent dehydration. If your dog is having trouble keeping water down, then offer him ice chips instead. Ice chips will help to keep your dog from becoming dehydrated, and they are better than gulping down water — which may cause his stomach to revolt, bringing the water right back up. Begin to introduce small amounts of bland food instead of dog food. It’s a fairly lengthy process to get a dog through a bout with vomiting. This means no food for some time, followed by ice chips and/or a very bland diet for awhile. Here’s the process: After your dog has stopped vomiting for at least 12 hours, instead of giving him regular dog food (which may immediately upset his stomach again), offer bland food such as as rice or cottage cheese with skinless boiled chicken mixed in. A bland diet is always best following dog vomiting. Once your dog can keep a few bites of the bland food down, then 4 hours later offer a bit more of the bland food. Add a few more bites of the bland food every 4 hours until the vomiting has completely ceased. Then, slowly begin to re-introduce small amounts of your dog’s regular food. Monitor your dog closely to prevent dehydration. It is very important to keep a close eye on your dog’s behavior and the overall condition of his body. If left untreated, dehydration in dogs can lead to organ failure and death. (Here’s how to properly treat dog dehydration. )If you notice some very early signs that mild dehydration may be setting in, then give your dog unflavored Pedialyte diluted with water. If he won’t drink the Pedialyte/water mixture, then give him some beef broth or chicken broth instead. To make your own, simply boil some water and add a couple beef or chicken bouillon cubes. Once the cubes dissolve and the water cools to room temperature, serve the broth to your dog. This flavored broth will keep your dog hydrated while you’re waiting for his stomach to settle down. NOTE: Most cases of dog vomiting will clear up within 24 hours or less. If your dog has not stopped vomiting within 24 hours, then you need to take your dog to see a veterinarian in order to get a proper diagnosis and the best treatment for your dog’s vomiting. If your dog continues to vomit after 24 hours, it is time to take him to a vet because there could be a more serious condition that a home remedy won’t be able to help with.